Part 1 of the New Additions Series covered the first step in my dystopian sci-fi story-writing process - brainstorming insights and ideas that could drive the social commentary of a possible story idea. The next stage of my process is to tease apart each of these potential insights in an attempt to turn an idea into an outline. 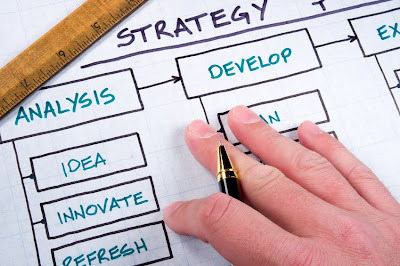 Maybe it's my background as an Advertising Planner, but I feel compelled to map out the core elements and purpose of a story idea - a "strategy", if you will - before I dive head first into writing. Through the process of developing an outline strategy, I find out that ideas that were initially half-baked begin to transform into story ideas with much more potential. Below are the key sections of the outline. In addition to describing what would typically go into each section, I'll use the short story concept that I'm currently working on, "Mail Order Bride", to provide an example of the write-up that went into each... Enjoy! The premise is based on the insight or idea that was developed during the brainstorming stage of the process. It takes that insight and expands it into a brief description of the world or future that would result from it. In other words: what is the world of the future in which the story will take place in? What makes it different than the present? Eg. For "Mail Order Bride", which originated in the "reliance on dating websites" insight from Part 1 and the idea of Homophily, the premise is: "In a world where "Homophily" rules the online dating scene, one dating service offers to set people up with their perfect match: someone eerily similar to themselves..."
The synopsis is simply a one or two-line sentence that describes the core thread of the story - the elevator pitch, if you will. It's different than the premise because it doesn't just describe the background of the world in which the story takes place, it describes what actually happens in the story. Figuring out what the core thread will be requires the most imagination and foresight of all the steps. Eg. For "Mail Order Bride": "A lonely middle-class man gets just what he wished for - a bride that thinks and acts just like himself. He soon realizes, however, that there's something very strange with his perfect match, who is almost too much like him." The lesson is essentially the underlying moral of the story - the key question or thought that the reader should take away about our current society. As most dystopian sci-fi, in my opinion, is really a commentary on our current society and where it's heading, the lesson clarifies what that commentary actually is. Eg. For "Mail Order Bride": "The best matches aren't always carbon copies of yourself." Most of the stories that drive a deeper connection with their audiences are based on universal story archetypes, themes, or narratives that have existed and evolved from the beginning of time (see this article I wrote on the subject for more info on archetypes). Outlining a story archetype isn't a chance to necessarily copy the elements of a story that came before, but rather a chance to tap into and change a story that already has a footing in the universal human consciousness (that sounds pretty heavy, I know). Eg. The story archetype for "Mail Order Bride" will be something akin to "The Stepford Wives". One of the best parts about writing a collection of short stories is the ability to experiment with different styles of writing and storytelling with each new story. For example, will it be a 1st-person, involved style, in the case of a story that is narrated by the main character? The style that you choose to tell the narrative will have a huge impact on the effectiveness of the story and its characters. Eg. For "Mail Order Bride", I've chosen to go with a unique style of 1st-person, involved, which I've called "Correspondence". The entire story will be told through correspondence from the expectant husband to the dating website/corporation. This will allow the reader to really get inside of the main character's head, and see how he reflects upon events that have already happened. The final step in the outline process to briefly note and delineate the key characters who will drive the story. Often this will involve the further use of archetypes, except this time, character archetypes. The character archetype doesn't necessarily need to turn each character into a one-dimensional stereotype, rather it serves as a guide to the role that that character will play in the story. Eg. For "Mail Order Bride", there are only three main characters: Larry (the husband and "Lonely Hero" archetype), Loriana (the mail order bride and "Strange New Love Interest" archetype), and the corporation, which I haven't named yet (the "Puppetmaster" archetype, since they seem to be pulling the strings).